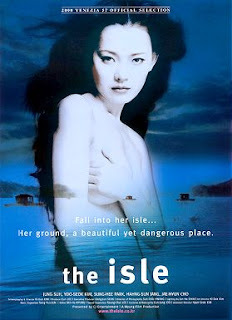 The Isle is one of my favorite Ki-duk Kim films. It's a bit difficult to describe why, because like all his films, it is very quiet, with almost no dialogue, and all about the atmosphere. He even made one of the characters mute. Still, she is a glorious femme fatale, though (like all of her kind) she does not wish to be. The title might be a play on the term "No man is an island" with emphasis on -play- as the dear director physically put a man on house-boat floating on a lake. I won't give any more away, except to say it's a love story that I can recommend as something to watch with a girlfriend or wife or transvestite prostitute or whatever female company you like to keep. Unless your loved one is the type who's into Fast and the Furious and Jason Statham. Then I advice you make fun of her, and tell her she's fat. Because if The Isle teaches us anything, it is that love should hurt. Ok....another film for my list. I'll never catch up, and that's a good thing. Loved "Spring, Summer, Fall, Winter... and Spring"